Where We've Been: Chicken Pochero... Sort of. 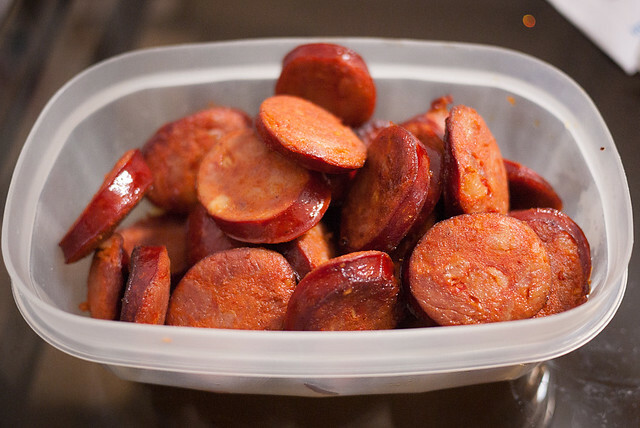 Chorico (different from chorizo) is a portuguese sausage, not too spicy but it does add a nice layer to the dish. 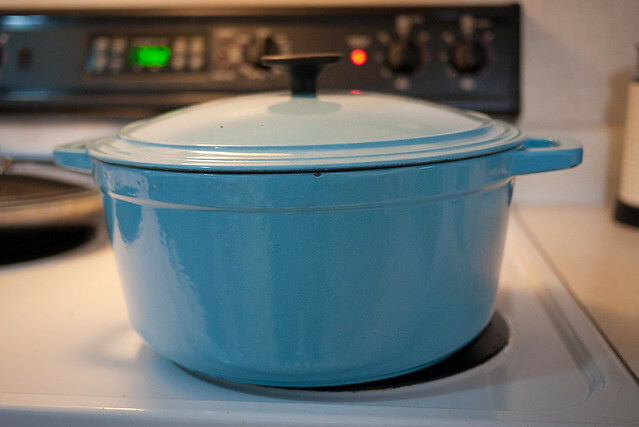 We love using our enameled dutch oven! It's a Martha Stewart from Macy's. we got it cheap compared to Le Creuset but as you can see, some of the paint is already chipping. I guess you get what you pay for in this case. 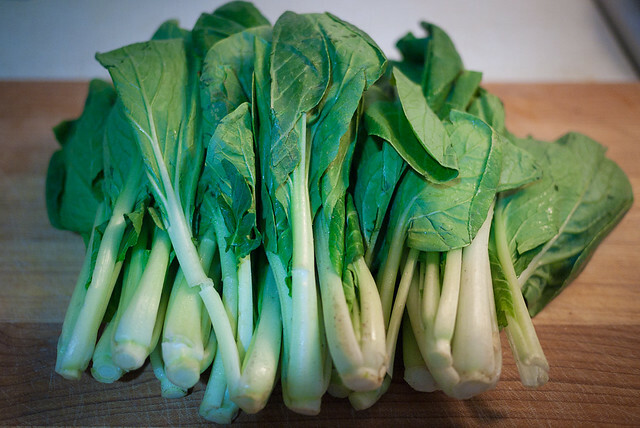 It looks like a lot of Bok Choy but it does get cooked down quite a bit. 1. Chop and fry the plantains in a med-large pot until lightly brown then set aside. 2. 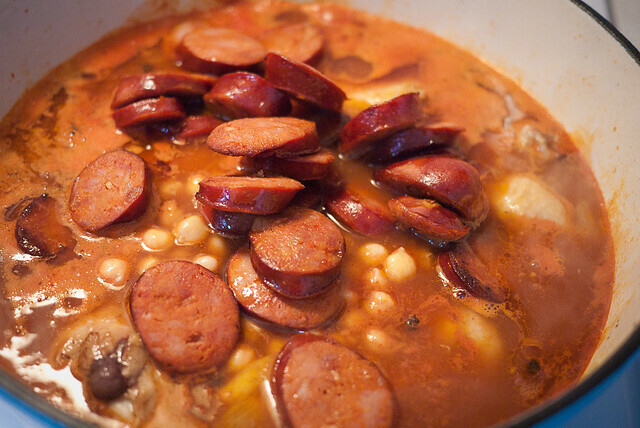 Chop and Fry the chinese sausage in the same pot until lightly brown then set aside. 3. Sauttee the garlic and onions until aromatic then add the diced tomatoes. 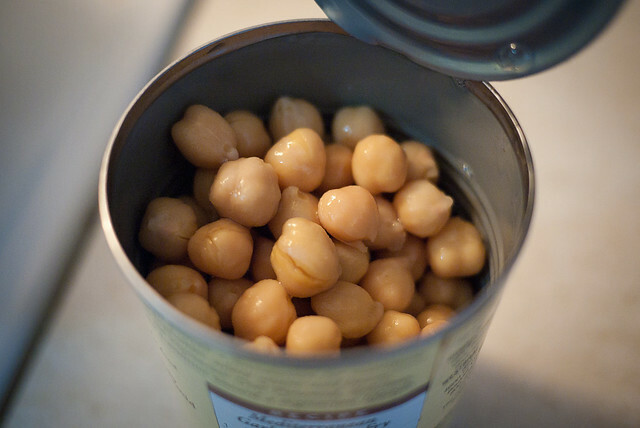 Keep sautteeing for 2-3 minutes. 4. Add the chicken and cook for 5 minutes. 5. Add around 2 teaspoons of patis (fish sauce), pepper corns and tomato sauce and mix well. 6. 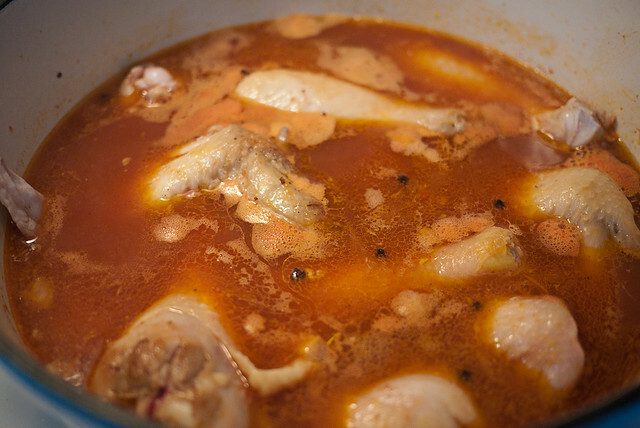 Add water to cover the chicken (or more if you like more broth), add the chicken cube and simmer until the chicken is cooked through. 7. 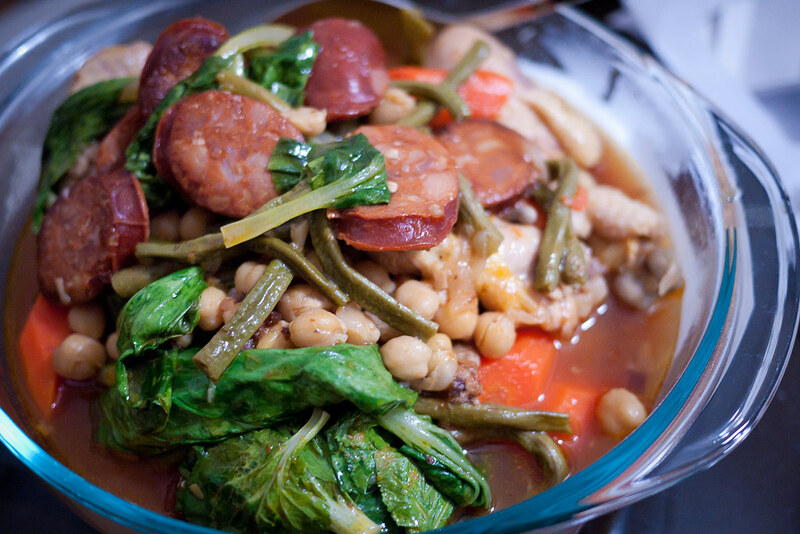 Put back the fried sausage, banana and garbanzos and simmer for 5 minutes. 8. 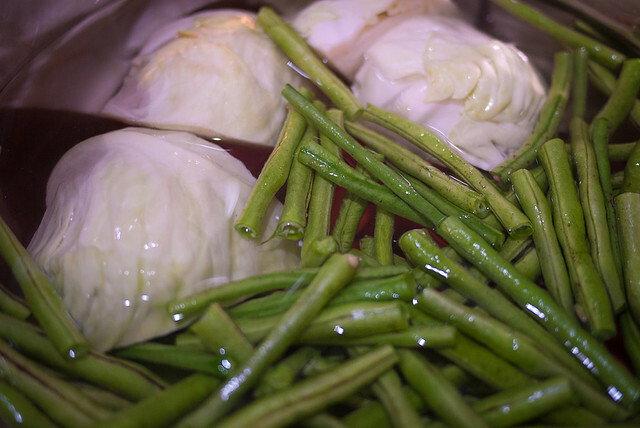 Add the cabbage and green beens and simmer for an additional 5 minutes. 9. Add the bok choy and turn off the heat. 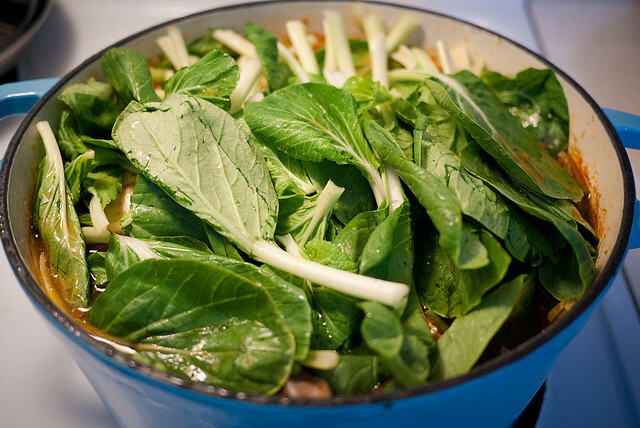 Cover the pot and let the heat of the dish cook the bok choy for 5 minutes. 10. 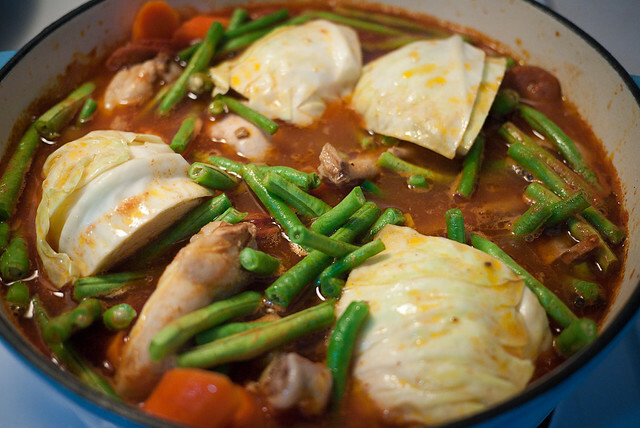 Serve hot over rice and enjoy!